The co-operative’s mission is to unite Europe’s highly fragmented media freedom community and to address media freedom violations in EU member states and beyond. Violations of press freedom will be observed, researched, registered and continuously reported to both the public and the political spheres. The ECPMF will work as a registration office, and as contact point for organizations and individuals. Stephan Seeger, Managing Director of the Leipzig Sparkasse Media Foundation, says: “Leipzig as the nucleus of the Peaceful Revolution of 1989 is the ideal location to establish the ECP. Tens of thousands of Leipzig citizens protested against the communist state and demanded freedom of the press. In addition, the Media Campus – located in walking distance – with the latest communication technology and flexible room solutions offers optimal conditions to host the centre and to organise its workshops, seminars and meetings”. Amongst the founding member organisations are the European Federation of Journalists (EFJ), the regional branch of the International Federation of Journalists (IFJ), which has 600.000 members worldwide. The campaigning organisation Index on Censorship also joins as a founding member. With the Russian Mass Media Defence Centre and academic institutions from Greece to Portugal, the Co-operative includes a wide spread of different interests in the legal, journalistic, academic and freedom of information communities. In a worldwide perspective, the ECPMF is unique in its dimension, structure and ambition. The Media Foundation of Sparkasse Leipzig has devoted two years of intensive work to the development of the ECPMF and applied successfully in close collaboration with partners from three other European countries and has now been awarded a grant for 2015/2016 of 749.000 Euro from the European Commission. Additional major financial supporters for the first year of the ECPMF are the City of Leipzig, the German Foreign Ministry and the Media Foundation of Sparkasse Leipzig. On the occasion of the founding assembly of the ECPMF the State Chancellery of Saxony handed over a donation of 100.000 Euro to support the initiative. From its very early stages, the setting-up of the project was intensively supported by Hans-Ulrich Jörges, Member of the Editorial Board of the magazine STERN and Editor in chief of Special Affairs of the publishing house Gruner+Jahr, and Christoph Keese, Executive Vice-President of Axel Springer SE. An all-party initiative from the European Parliament led by its President Martin Schulz supported the idea of the European Centre. Among the supporters within the European Parliament are the Vice-President of the EP, Alexander Graf Lambsdorff, and the Chair of the Foreign Affairs Committee, Elmar Brok. 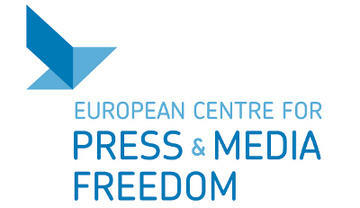 ECPMF’s activities will be based on activities that promote the spirit and the values of the European Charter for Press Freedom signed in 2009 by 48 editors in chief and leading journalists from 19 countries and subsequently notified to the European Commission. To prove the European scale of activities right from the beginning, the project partners of the ECPMF will have a meeting with the president of the European Parliament Martin Schulz on 30 June followed by a discussion and press conference in the European Parliament that brings together experts on press freedom, prominent journalists and media policy researchers in order to consider these issues and highlight the struggles on the ground.